I would love to know if Americans feel more alone than other folk? After forty years of knowing them (a few intimately) this seems to be the case… a tendency not yet towards mutualism… and me an mild aspie. Perhaps like immigrants in their own country, with everything to prove? Meaning, for me lies in our mutual adventuring. It would be the death of me to be given purpose like a job and told “off you go”. What a half person that would make me. No chance of any objectivity here but I’ve observed that Americans feel more insecure about their well being here. With the lack of any meaningful safety net and the extended family model in a weakened, broken state, I have to say that alone is what we feel. There are examples all around of families broken financially by forces beyond their own control like job layoffs and medical bills. Sad “human interest” stories play on the nightly news of these people depicting their fall from the wholesome middle class by some twist of fate and inevitably end with a show of glorious altruism by others who come off as saints in their mission to save another deserving American family from penury. Does it occur to my fellow Americans watching this treacle that we are all just three mortgage payments away from homelessness? That a major illness can wipe out a lifetime of savings? Do they understand how deep our insecurity is or do they think that it happens (often) to other poor slobs but would never happen to themselves? The realization that the government has only crumbs to offer in the event of financial disaster and the lack of close extended family whose well being is firmly interwoven with all members, can only lead to the conclusion that we are really on our own here when things go really wrong. Due to the media bubble we live in here I doubt if the average American knows that there is a discrepancy between the American social safety net and that of Canadians and Europeans. If they do know anything about this it’s often presented with a FOX news glaze of the horror of massive taxation and lazy parasites living off the diligent good work of a few individuals who must make a good day’s pay but have nothing left by the end of the week after their governments take their share. You said here once a while back that (paraphrasing) the fact that we have all these charitable organizations running around fixing financial disasters is evidence of a government that doesn’t address the needs of its citizens. I found that to be startling and so would most Americans, I assume. We are so used to charities filling in around the edges that we can’t think of any other way of doing things. It’s not lost on us atheists that religious groups must be quite pleased with this situation. How can a feeling of mutualism survive in this place? It’s seen as a weakness. Strength is linked with individual fortitude and resourcefulness. Strength of character and a killer instinct in business are what’s admired. To install the idea that mutualism delivers a valuable improvement in our general well being here with what we have to work with now seems very daunting. Why does life need to have a point? Perhaps there are those who can’t deal with the fact that the great majority of us will live hum drum lives of mediocrity just putting one foot ahead of the other because there isn’t a whole lot of choice in it anyways. We will live our lives as people who are not special or exceptional in any way, die and be utterly forgotten. In a hundred years time our belongings, savings, and all of our good works will be dispersed and consigned to oblivion. Dark stuff to most poor slobs here on earth, I suppose. But fear not! Religion offers an alternative to the black abyss. God cares about every one of us. He knows us personally and has a plan to help us. We are never alone when we have God breathing down our necks at every moment of the day and night. I only wish he could see his way clear to cutting a few checks to solve some real problems that he must know about. It would be so easy. Thank you for your thoughts, Laurie. Sometimes I think I am going mad. I am startled by how many Americans seem un-startled at their country’s condition. Society and its proxy, the State, seem so unloved, so un-respected as active participants in human existence. It can share no blame in the guilt of its young criminals, who must shoulder every last bit of blame. Nor can it deserve any praise for the successes of its business magnates who must be rewarded without let. The mindless jingoism seems an utter mockery of an actual functioning state. Fickle, partial charity marks at every chink in the bucket a failure of the state. But then the state, and with it society, must seemingly be starved out of any role. Unstartled maybe but there is plenty of disgust simmering that everyone hopes will produce results in the voting booth. My English friends seem perplexed that nothing is being done to toss the ignorant fool out but I must remind them that we need a crime. Can’t just call for elections. (not defending that idea). I feel that we’re in a stasis waiting for next November and meanwhile the thugs will push through as many of their measures as they possibly can using whatever means necessary to achieve victory. There is an eerie complacency though. A kind of a twilight zone feeling about the place. The fading state condition is all we’ve ever known. We have no security from the government and no tribe to depend on either. How can we know what it’s like when we’ve never known it? If American atheists have a sense of meaning or purpose, they didn’t get it from either of these sources. I think my own sense of purpose comes from an appreciation of ethics and thinking about my obligations to self, family, others and society. How to recognize harm and how to ameliorate it. Of course, it would be wonderful to have the resources of the government to implement these ameliorations but I don’t see that happening in the land of rugged individualism. Sorry, Dan, but I disagree. First, many people have trouble living without a “purpose.” (“If there is no purpose,” they say or feel, “what’s it all for?”). Secondly, life most definitely does have a point, it is to shuttle our genes into the next generation. Just because there may not be a religious point to it does not mean there is no point to it. Seems to me to be a restatement of Godel’s incompleteness observation — all such responses (to questions about the “WHY”-ness of something) requires an axiomatic level upon which further logic is based, and no matter how hard you try you’ll never have a finite and complete list of axioms that do not require further axioms and are completely self-explanatory unaxiomatically. All “why?” questions, have a habit of producing “how?” answers – which lead to more in-depth questions! – unless the thought processes run in circles around closed-loop theological preconceptions! All the discoveries of HOW the gravity interacts to stabilise orbits, answer SOME questions, but lead to the need for a more complex investigative analysis! – Unless the know-it-all woo-brain, shuts down and pronounces it is because god-did-it-in-mysterious-ways as part of a plan to create worshipping humans! Startled, not because I don’t see serious unhappiness about the current state of affairs, but among the Americans I see commenting elsewhere, startled that none trace it back to the political and economic right turn from 1980 onward and the growing systemic failure, truly a multiple organ failure, of their country. The otherwise corrective anxieties of ill health and job loss have been suppressed by generating a callous machismo and adopting quasi religious narratives of personal salvation and judgement upon others. The fact of the religious right doubling down in their own selfishness makes them spectacularly unlovable. Its really difficult not to join in. Mutualism is possible, perhaps, but not starting from here. Here’s a purpose I’m totally committed to and thrills me more than anything….. Doing everything in my power to maximise the free choice of the young. I don’t trust too many cultures, but I trust our wiring… innately mutualist. Right. Have they any way to see these things in perspective at all? This is the danger of living in a bubble. There’s no way to know how others are dealing with problems. From inside the bubble, one feels like the center of everything, the mean, median and mode of all things. Toss in a soupçon of jingoism and there’s no need to look outside the bubble because our solutions or lack of them are the BEST! In the early days of the current administration, when I pointed out the absolute disaster of the absolutely unqualified people who were chosen to fill cabinet positions, I was shocked when faced with blank stares of the Trump supporters. “Which one are you talking about?” All of them! “No! Not ALL of them!” Do you understand that these cabinet appointments require a person who is at the top of that field with a lifetime of education and experience in that particular field if they have any hope of doing a decent job? And even that is just the starting point. We need brilliant thinkers, good character, ability to understand history and develop a wide view of the future, courage to make big decisions FOR THE COMMON GOOD! Blank stares is all I ever get from them. I never spend much time thinking about conning others but one thing that’s clear to me now is how easy it must be. Not only is it easy to con and manipulate people, the victims can be active participants in their own demise. This is not a handful of intellectually challenged backwoods hicks, it’s a large number of Americans. If they can’t see the disaster of the cabinet appointments then how in the world can they see systemic failure?! These people have a very low bar. Very low. The bar is resting on the floor. The devotion of the young to Bernie is the most interesting and hopeful sign that mutualism isn’t dead and buried yet. Just maybe in a coma on life support machine. Blank stares is all I ever get from them. With an endless supply of superficial media distractions, why would any of them bother to study anything outside of their little employment box and pay-packet, plus social gossip about “celebrities,” sports, and advertised fashion status symbols? I feel that many people think that God is what gives purpose to life. Frequently, it seems like God or someone’s religion is supposed to be what gives life purpose. I do of course disagree, being an atheist myself. However, I do find a meaning for my own existence that at least makes it worthwhile to get up in the morning and go to work and keep things going. I do wonder why so many religious people assume that without God there isn’t a purpose. I almost find more meaning in life because in my opinion there is doubtfully a god, or at least a sentient one that involves itself in our affairs. I know this is all I have and when I do feel depressed or discouraged, because life often doesn’t work out in a fair way or the way I want, I tell myself that this is all I have regardless, and I may never exist again. So I better try to enjoy it and make it count. Anyways, nothing irritates me more than the way religious people tend to infer that an atheists life lacks purpose. I have encountered many examples of this, but it simply is not true. Ultimately, I do think humans strive for some sort of purpose, but not all of us have the hubris and false self importance to think that we are performing some great divine work and are therefore better than other people and that we will die and go to heaven and reap eternal rewards for going around forcing our opinions on other people. Every other ‘purpose’ in our lives is invented by us, chosen by us. What we see as our purpose is to a large extent a reflection of our personality and character. A part of our identity. For this reason, if it is to have any real personal significance at all, it can only come from us, ourselves. It has to be OUR purpose, not a purpose imposed on us by someone or something else. I can no more find my purpose in life by obeying an instruction to find it in following a god than I can by complying with my father’s longing for me to become the concert pianist he could not – unless, that is, I have defined my own purpose as being to devote my life to pleasing my father. So perhaps the religious have defined their own purpose as being to please the god they believe in. If so, and provided they’re not causing any harm to others in doing so, that’s up to them. But it’s nonsense to suggest that the purpose they have defined for themselves is inherently more meaningful than any other purpose we might define for ourselves. And of course, too often they haven’t defined it for themselves, but have simply had it drummed into them since infancy. In fact, I would argue that seeing this life as nothing more than the qualifying round for the Real Deal, an unproven afterlife, actively diminishes the value of this life. It is nothing: a mere audition. And worse than pointless if you fail it. Parenting is an awesome, guilty pleasure for me. Guilty because one’s kids had no choice in the matter and all lives contain arbitrary amounts of misery. Awesome, because my kids are only a little bit like me. They are self made for the most part. I admit to living a little vicariously through them, delighting in their delights and more than a little satisfied as they enter adulthood, that they can do without me. I could have coerced them down this or that path, as parents of old nearly always did, but I truly suspect I would have a lesser sense of personal achievement had I done so. I could have urged them to think first about saving their economic souls with a really well paying or very secure job. But I didn’t. All I wanted for them was a rich interior life, an inner resource that would always be with them, a take on the world that it was always interesting. As I never tire of telling people, this is what my dad did for me and a proxy “dad” did for him. I hope it was a gift (albeit fumbled) of freedom, rather than a mind forged manacle. In my view God (the traditional Abrahamic one) is a deadbeat, life-denier-dad. No summoner, He, of personal achievements and their pleasures, no cultivator of folk living for, by and through each other in an unbroken chain of mutual adventuring and open ended societal achievement. To me Life has no innate purpose, but that doesn’t mean that an individual can’t choose from time to time to have a purpose to direct their activities and the use of their time for a period of their life. However, they can also choose not to have a purpose. That’s their choice. Laurie and Carl are profoundly right when they observe life has no innate purpose. But it is not a concern foremost in my mind, especially as I see absolutely no personal purpose in endlessly giving two thumbs to a deity. Being given meaning is being gifted manacles. I would love, though, to run a survey over atheists in the US, UK and European countries. I do suspect the US respondents will more often lead with this “shocking” truth having perhaps more recently encountered it in transition from a religious heritage and having little enough experience of a more strictly secular society doing its important and involving works. US atheists have a tougher, bleaker time would be my conclusion. And then, all we need is someone in the US, someone in the UK and someone like my daughter hoping to complete her education in psychology in Europe, in Europe. Hang on a minute! Nice question from the good professor. The short answer as ever is evolution. Depressed folk are anhedonic and don’t tend to do the horizontal tango. Anyway mood seems to scale to the middle of the range for maximum utility. I remember a documentary on one of the last true hunter gatherer tribes in South America. Lifespan 30 to 40 years. Brutal, risky, even without a mortgage. I remember a father’s simple delight in what he had, by turns laughing and serious and proud of his beautiful children. A sustaining happiness come from a sustained delta in circumstance and the learning through misfortune of what you really like. Besides no one in their right minds wishes for freedom of thought. I want to be correct and all-knowing in my thoughts. Nobody in their right minds want to do what is tediously correct and allocated, I want to be free in my actions, making what I wish. We can all aspire to godhood rather than serfdom….or is that just some of us? Interesting Edge questions. I think I can answer one or two. Does our thirst for justice at every turn reduce our achievement of fairness? Ha! This is obviously meant to be! or is that just some of us? Yes it’s just some of us. This is a disturbing realization that is known to students of social progress but has now been observed to exist on a massive scale. I have a supplementary answer for Sapolsky. I think there are many at different scales of viewing which he would appreciate. It is on the nature of memory. I saw perhaps the most beautiful film ever, more so than “Your Name” Makoto Shinkai. “The Red Turtle” Michael Dudok De Wit via Studio Ghibli. I can’t spoil this but note the two tsunami and what it says about memory, and how we live with the past. My library system has the film. It’s on the way. I’ve been thinking about memory these days. I’m reading The Man Who Mistook His Wife for a Hat by Sacks. I realized I’ve not read much of his work and am working through his books. I’ve read Hallucinations a while ago. Next up is Awakenings. The patients who suffer devastating deficits in memory were fascinating. Sacks wonders how they feel purpose when they have no day to day continuity that memory gives us. They sometimes compensate with confabulations but the idea of getting up every day with no notion of what has happened in the days before or even the decades before it profoundly disturbing to imagine. They are stuck in a “groundhog day” existence. I had to do some reading on neuroanatomy for a refresher! What is important is exactly his concern for the human experience and the humanity of his patients. He always thereby asks the question about what underlies our own treasured humanity. 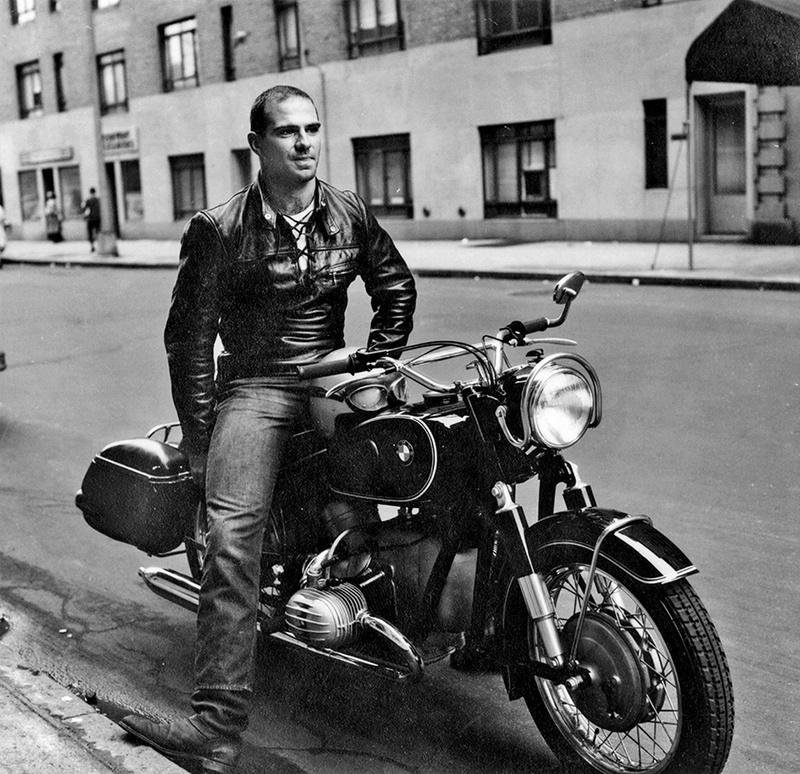 Somehow it was a bonus to discover that this most tender of observers was variously a comprehensive drug-taking, leather-clad, gay biker. a comprehensive drug-taking, leather-clad, gay biker. A very interesting guy. I feel that way about Feynman too. Think outside the box types. The antithesis of the fragile deadly boring science nerd cliche. Sacks and Feynman are two individuals that must have been the funnest interesting friends to have! Well it’s pretty clear whether you believe in a “God” or not that nature has gone out of it’s way to mold us into reproductive entities. I guess you could argue we are all just lucky primates and our intellectual capacity has outgrown that purpose and so now we are free to define our own. I would argue that personal purposes have less value than collectively shared purposes based on the fact that this intelligence was formed during a transition from family, to tribe, to civilisation. PS This is my first post here and I am more interested in reading atheist posts about the relationship between logic and non logic and what meaning they see if any in these two ideas. Where would you find anything about that in previous discussion boards? Having brains which are capable of forward planning, does gives beneficial options, but also opens up opportunities for mistakes. Individual personal purposes are less likely to achieve objectives, than mutually agreed team efforts. PS This is my first post here and I am more interested in reading atheist posts about the relationship between logic and non logic and what meaning they see if any in these two ideas. Logic is an inductive or deductive reasoning process, which can progress hypothetically and consistently from mathematical axioms, or from objective scientific observations and evidence. Non-logic is referred to as “fallacies” which invalid modes of thinking which lead to inconclusive or false conclusions. A fallacy is the use of invalid or otherwise faulty reasoning, or “wrong moves” in the construction of an argument. A fallacious argument may be deceptive by appearing to be better than it really is. Some fallacies are committed intentionally to manipulate or persuade by deception, while others are committed unintentionally due to carelessness or ignorance. The soundness of legal arguments depends on the context in which the arguments are made. Fallacies are commonly divided into “formal” and “informal”. A formal fallacy can be expressed neatly in a standard system of logic, such as propositional logic, while an informal fallacy originates in an error in reasoning other than an improper logical form. Arguments containing informal fallacies may be formally valid, but still fallacious. “Fallacious arguments usually have the deceptive appearance of being good arguments.” Recognizing fallacies in everyday arguments may be difficult since arguments are often embedded in rhetorical patterns that obscure the logical connections between statements. Informal fallacies may also exploit the emotional, intellectual, or psychological weaknesses of the audience. Recognizing fallacies can develop reasoning skills to expose the weaker links between premises and conclusions to better discern between what appears to be true and what is true. A common error by those lacking skills in logic, is to try to stick a badge of “Logic” or a badge of “science”, on to an assertion, supporting their views, which is not in anyway derived by processes of logic. A similar flawed thinking process is simply to try to label circular endorsement of asserted pre-conceptions with a false authority badge of “logic”. Where would you find anything about that in previous discussion boards? There are archives on this RDFS site, where topics can be found by googling site:richarddawkins.net and a topic title.